We need a brand new look for our existing website [login to view URL]! A landing page version of the Web Design would also be needed. 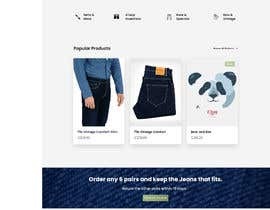 In 2019 we are expecting new products in denims, leather and other organic cotton articles like Jacket, Pullovers, Sweatshirts etc.. Although, we use organic Japanese Denim in most of our products and that's our forte, but a neutral clean design is what we aspire to present! Please submit your entry if you know the UI/UX basics and have already done a few good projects. We would be using Wordpress/WooCommerce Platform to realise this project. So there could be one winner or there could be 2 winners! I would immediately delete a copy or similar entry ! So, no sealed required! Many thx for submitting and I appreciate all the great efforts! I am also removing entries which are not even closer that is required. I have updated the Contest Post and added some links for references. Please check the landing page links specially. Hello Ch, Website server not working. We had some issues with the website .... but I have posted the reference sites that we like! Did you make something to submit? Working on it Please Don't choose winner. Are you need only .psd file or wordpress ?